Yoga by Mary Ann blends together elements of Hatha and Iyengar yoga styles with the teachings of Deepak Chopra to create a safe and nurturing environment for all levels, from the curious beginner to the experienced yogi. Class sizes are limited to five yogis per class. Signing up will secure your spot. Each class is $20. Tibetan singing bowls are played in every class! In this class, we will move through poses as we weave in the elements of Deepak Chopra’s teachings from the Seven Spiritual Laws of Yoga. What you learn through your asanas (poses) can be seen in all aspects of life. 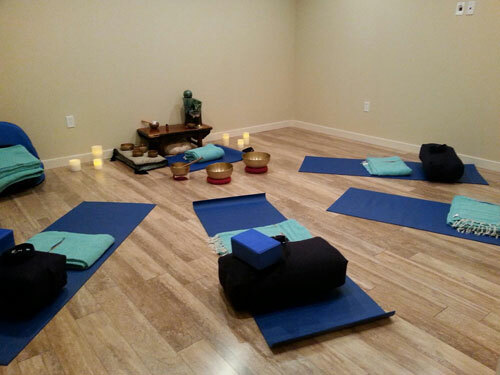 In this session, we will use restorative poses, reiki, health awareness, and guided meditation to relax and unwind. Come join us on this inward healing journey and set aside an hour to be completely cared for. Join in on a six week small group course exploring what means to live an Ayurvedic lifestyle starting on Wednesday, September 16th. Together, we will discuss ways to enhance your daily routine, your diet, and your life. The principles of Ayurveda and yoga can help to bring balance in today’s busy world through the conscious choices we make to nourish our bodies and spirit.